Who should use Travelocity's co-branded credit card? In the comments to a post last month, reader travel well asked whether I had any experience with the Travelocity Rewards co-branded American Express card. I hadn't heard of the card, but did some research, and want to share what I found with readers. There are two versions of the Travelocity Rewards Amex: a $39 annual fee version and a no annual fee version. The $39 annual fee version earns 5 points per dollar spent at Travelocity, 2 points per dollar spent at your choice of either gas stations, grocery stores, or restaurants, and 1 point per dollar spent everywhere else. The link I found offers 7,500 bonus points after your first purchase [edit: see above]. 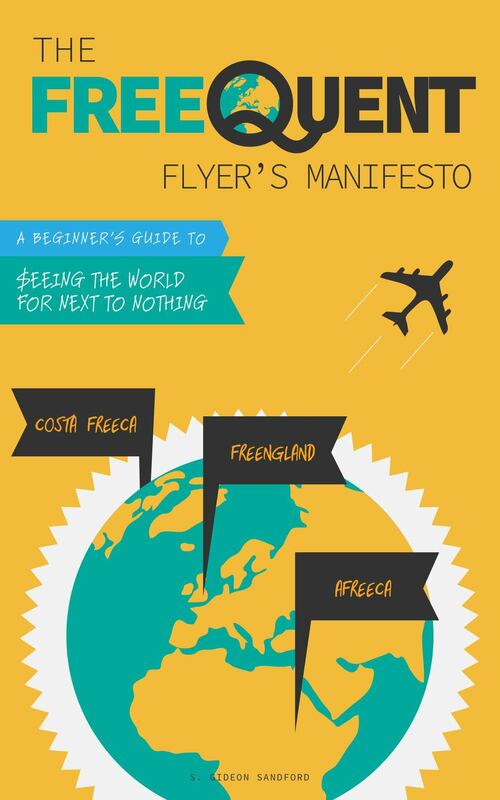 The no annual fee version earns 3 points per dollar spent at Travelocity and 1 point per dollar spent everywhere else. It offers 5,000 bonus points after first purchase. As that list illustrates, points are worth 1 cent each until you reach the 20,000 point level, when the value jumps to 2 cents each. Then each subsequent point is worth an additional cent, until you reach the 40,000 point level, when the value jumps back up to 2 cents each. This means that the most lucrative redemptions are always in intervals of 20,000 points. Fortunately, the Travelocity Rewards card does allow partial redemptions, and indeed as far as I can tell allows redemptions only in the tiers specified. Redemptions are made directly through the Travelocity website, for reservations made with Travelocity. After selecting your flights, hotels, or rental cars, select the Travelocity Rewards American Express as your method of payment, and you'll see the option to redeem points for part of your purchase. 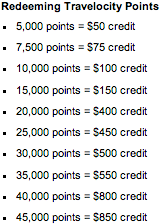 As the above analysis makes clear, whenever possible you should redeem them in blocks of 20,000 points. When you do so, you'll earn a full 10% rebate on all your purchases made at Travelocity with the $39 annual fee card and 6% rebate with the no annual fee card. After selecting your redemption amount, complete your purchase and you'll receive a statement credit for the amount of your redemption. Who should use the Travelocity American Express card? This card looks great on paper: a 10% rebate on Travelocity bookings, which can be paired with 2 Ultimate Rewards points per dollar when you click through to Travelocity through the Ultimate Rewards Mall. Still, there are two drawbacks that I think are serious enough to keep me from getting the card personally. First, the more lucrative card has a $39 annual fee. Admittedly, that won't break the bank – if I were able to redeem my points regularly at the 20,000 point level, then the 5-6 cent edge this card has over a card like the Chase Sapphire Preferred (for double points on travel) would be justified. That's especially true if carrying this card allowed me to cancel my Sapphire Preferred, which carries a hefty $95 annual fee. However, the second problem is that 20,000 point threshold. To earn those 20,000 points, I'd need to spend $4,000 on Travelocity, which isn't realistic for me personally: I purchase travel using my Barclaycard Arrival World MasterCard (for a 65% discount on paid travel after manufacturing spend), I redeem US Bank Flexpoints for paid travel (for a 74%-80% discount on paid travel), and of course I redeem airline miles for award travel. Even more importantly, sometimes Travelocity doesn't have the best price on airline tickets, or doesn't offer itineraries that are available elsewhere, in which case I use other online travel agencies instead or book directly through the airline. All that would add up to paying multiple $39 annual fees while I waited to hit the 20,000 point sweet spot. All that said, if you already spend a lot of money on paid travel through Travelocity, enough to hit that 20,000 point threshold at least once a year, then this is a card with terrific earning potential. I would probably pair it with a Chase Ink card in order to continue to earn double Ultimate Rewards points through direct hotel bookings (and have access to the Ultimate Rewards Mall) while still earning hotel loyalty points and credit for nights and stays towards elite status.